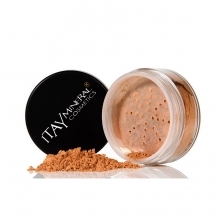 55% OFF USE CODE "FACE55"
ITAY Minerals are made from only the highest quality 100% all natural mineral powders. Unlike some mineral makeup lines, ITAY Minerals does not contain harmful chemicals, dyes, or talc, which can irritate your delicate skin. All of our makeup contains our oil-free mineral formula which is water-resistant, so it will remain on your skin throughout the day and into the night, and contains a high level of antioxidants to help protect your complexion from environmental factors that can cause damage and aging. With so many shades and colors to choose from, ITAY Minerals will give you a luminous glow that will leave you feeling confident and beautiful for any occasion all day every day!